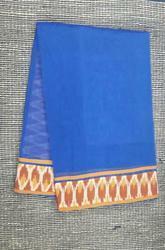 Keeping in mind the demands and choices of clients, we offer a wide range of Supernet Sarees. These products are exclusively designed and developed as per latest fashion trend and following the exact demands of style loving ladies. Our products are available with us in various fantastic color combinations. Yellow with green half and half style soft net saree having light gold shimmer border with gold zari embroidered buttas towards bottom.